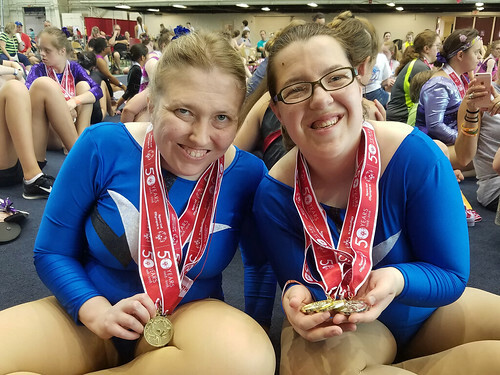 We are very proud to report that SEASPAR’s 19 athletes who competed at the Special Olympics Illinois Summer Games earned a total of 29 medals, including 15 gold, at the competition held at Illinois State University June 15-17! Unfortunately, the extreme heat on July 16 led to the cancellation of two of our athletes’ events in Athletics and Soccer, but all of the athletes had at least one opportunity to demonstrate their skills. The Summer Games is the largest of the more than 175 Special Olympics competitions held throughout Illinois each year, and is the final state competition for Athletics (track and field), Bocce, Gymnastics, Powerlifting, Soccer, and Swimming. Approximately 4,000 athletes competed at the event at the Illinois State University campus. SEASPAR trained athletes in all six sports of the competition. SEASPAR was represented by one competitor in Athletics (track and field). At the age of 60, Randy Naberhaus of Woodridge was the oldest athlete from SEASPAR’s region to qualify for Summer Games in this sport, and did so in the Mini Javelin and 50M Assisted Race events! Unfortunately, the 50M Assisted Race event was canceled due to extreme heat, but Naberhaus earned a silver medal in his division of Mini Javelin. In the sport of Bocce, SEASPAR athlete Ron Kamper of Indian Head Park earned a silver medal in the Traditional Singles event. Anna Cavallo, Downers Grove: Gold in Balance Beam, Floor Routine, and All Around. Silver in Vault. Bronze in Uneven Bars. This was Anna’s third year competing in Level 2 Artistic Gymnastics at Summer Games! Kari Winter, Downers Grove: Gold in Balance Beam, Uneven Bars, and All Around. Silver in Floor Exercise. Seventh in Vault. This was Kari’s third year competing in Level 2 Artistic Gymnastics at Summer Games! Emily Lundvall, Westmont: Gold in Bench Press and Combination. Bronze in Deadlift. This was Emily’s fifth year competing and earning gold in Powerlifting at Summer Games. She set new personal bests in both the Bench Press (90 pounds) and Deadlift (135 pounds) events! Allen Rosete, Darien: Gold in Deadlift and Combination. Silver in Bench Press. This was Allen’s second year competing and earning gold in Powerlifting at Summer Games. He set a new personal best in the Deadlift event (135 pounds)! One SEASPAR athlete participated in the Soccer competition on a cooperative team representing SEASPAR and the Lily Cache Special Recreation Association, which serves the Bolingbrook and Plainfield Park Districts. Nate Church of La Grange advanced with his teammates to the championship game in their division, but it was unfortunately canceled due to extreme heat. This was the team’s sixth year qualifying for Summer Games! Nathan Buresch, Downers Grove: Gold in 25M Freestyle. Fifth in 4X50M Freestyle Relay. Jason Grudem, Woodridge: Fifth in 4X50M Freestyle Relay. Sixth in 50M Breaststroke and 50M Freestyle. Samantha Henderson, Naperville: Fourth in 50M Backstroke. Sixth in 50M Freestyle. Ryan McGuire, La Grange: Fourth in 25M Freestyle. Fifth in 25M Backstroke. Aidan Metzl, Woodridge: Gold in 25M Backstroke. Sixth in 25M Freestyle. At just 10 years old, this was Aidan’s first Summer Games! Conor Mulcahy, La Grange: Gold in 25M Backstroke. Fifth in 25M Freestyle. At just 10 years old, this was Conor’s first Summer Games! Mark Ploskonka, Darien: Silver in 4X100M Freestyle Relay. Fourth in 50M Freestyle. Seventh in 50M Backstroke. William Porch, Westmont: Gold in 50M Backstroke. Silver in 4X100M Freestyle Relay. Fourth in 50M Freestyle. Adam Sikora, Lisle: Bronze in 25M Breaststroke. Fifth in 4X50M Freestyle Relay and 50M Freestyle. Sam Smetko, La Grange Park: Gold in 50M Backstroke. Silver in 4X100M Freestyle Relay. Seventh in 100M Freestyle. Sam competes in the top division in the 50M Backstroke event, and with this year’s win, maintains his position as the top swimmer in this event for Special Olympics in the state of Illinois! Daniel Smrokowski, La Grange Park: Bronze in 50M Freestyle. Fifth in 4X50M Freestyle Relay. Sixth in 50M Backstroke. Chris Tegeler, Darien: Silver in 4X100M Freestyle Relay. Fourth in 100M Freestyle. Eighth in 50M Backstroke. Join us in congratulating these athletes on their hard work and well-deserved recognition! Learn more about SEASPAR’s Special Olympics programming. Check out photos from the Summer Games in the gallery below, or view the photos on Flickr!